A powerful and important book for fans of Mark Haddon, THE SILVER LININGS PLAYBOOK and Jay Asher. Eighteen-year-old Leonard Peacock knows exactly what he'll do. He'll say goodbye. Not to his mum - who he calls Linda because it annoys her - who's moved out and left him to fend for himself. Nor to his former best friend, whose torments have driven him to consider committing the unthinkable. But to his four friends: a Humphrey-Bogart-obsessed neighbour, a teenage violin virtuoso, a pastor's daughter and a teacher. Most of the time, Leonard believes he's weird and sad but these friends have made him think that maybe he's not. He wants to thank them, and say goodbye. In this riveting and heart-breaking book, acclaimed author Matthew Quick introduces Leonard Peacock, a hero as warm and endearing as he is troubled. And he shows how just a glimmer of hope can make the world of difference. 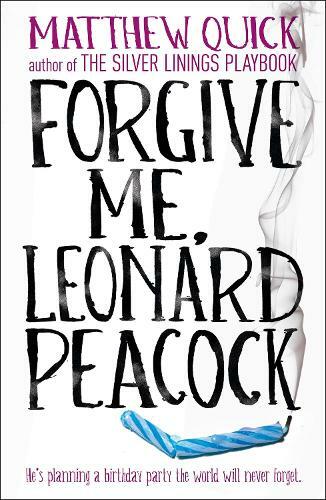 Forgive Me, Leonard Peacock follows Eighteen-year-old Leonard on his birthday as he plans to say goodbye to his friends before turning his grandfather's pistol on Asher Beal and then himself. I'm not sure what I can add that my fellow booksellers haven't said already!